Heat oven to 350°F. Mix cake ingredients (cake mix, oil, eggs, water). Stir in butterscotch chips and 1/4 of the crushed Butterfingers. Bake cake as directed on box for 13×9-inch pan. Poke top of warm cake with every half inch with the handle of a wooden spoon. Pour condensed milk over cake until absorbed. Pour caramel syrup over cake. Top with 2/3 of remaining crushed Butterfingers, pressing into cake. Cover and refrigerate cake about 1 hour. Stir cool whip and whipped frosting in medium mixing bowl until combined. Spread over cake. Top with remaining crushed Butterfingers. Cover and refrigerate at least 1 hour. Store remaining cake in refrigerator after serving. * A lot of recipes call for caramel topping. 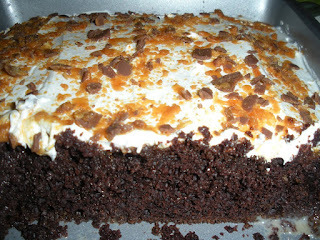 I only had caramel syrup in my kitchen when I made the cake, and I think I actually prefer it. * This makes a lot of frosting. Don’t feel the need to use it all! It is great on it’s own as a leftover treat.